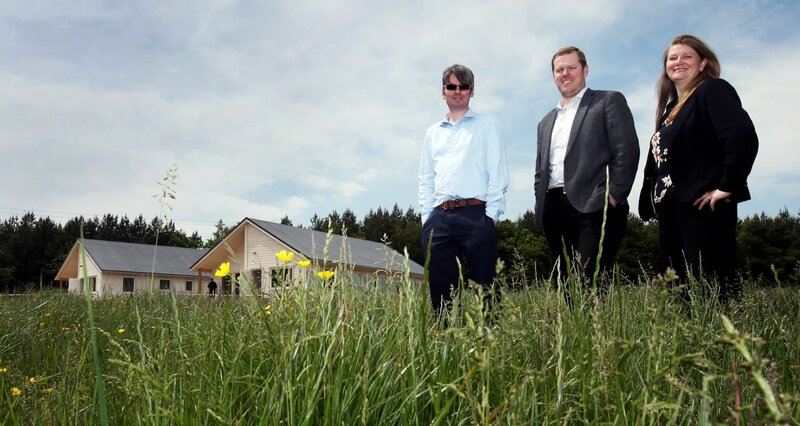 TWO ‘eco-kabins’ at Holmside in County Durham, that will provide respite care to young people and adults with autism and learning disabilities, are reaching completion by architecture and design firm _space group. Newcastle based _space group was appointed by a partnership of Durham County Council (DCC), the North East Autism Society and the environmental charity Groundwork North East to create the single-storey, lodge-style eco-kabins in an innovative project. It was a requirement that the buildings be of a high environmental standard and constructed using timber from sustainable sources, and the work be supplied by a local contractor, _space group was selected. To meet the specific needs of people with autism, the interior design considered colour schemes, layout, accessibility and furnishings in order to provide a bespoke and stylish environment that mirrors the nature of the surrounding farmland. After the site was prepared the lodges took just one week to actually erect on-site, due to their innovative off-site manufacture process. A six-week fit out period is currently close to completion, to ensure they are ready for their first visitors this summer. The lodges are eco-friendly due to _space’s philosophy that uses highly efficient, thermally controlled airtight envelopes, in a similar way to a German system approach ‘passivhaus’, ensuring the structures are highly insulated. Mechanical ventilation heat recovery systems and high performance electric panel heaters have also been installed. The living rooms are south-facing to maximise solar gains and natural day light, whilst the thorough resourcing of materials has meant that there was minimal wastage on-site. A sustainable drainage system is also in place. As part of the community and social sustainability emphasis on the project, _space engaged young NEETs (those not in education, employment or training) from Consett-based Delves Lane Mutual in the external painting of the lodges with support from Groundwork North East and the Council’s Targeted Recruitment & Training (TRT) project. Attendees of the neighbouring North East Autism Society training centre at New Warlands Farm have also been involved in the project. They were present when the eco-kabins arrived and have visited _space group’s headquarters where they were given an overview of how the industry works from the design and procurement stages through to the construction delivery process. _space group associate director Keith Handy said: “This project has been a great opportunity for us to develop our new off-site manufacturing approach to sustainable living design. We are extremely appreciative that Groundwork North East, along with Durham County Council and the North East Autism Society chose _space group for their new development in Holmside. As a company we are always very enthusiastic to contribute to important community projects such as this. “The lodges will offer a much needed resource to provide specialist respite care facilities in a unique setting that increases the type of accommodation people can choose to stay in. The accommodation was designed specifically to meet their users’ and carers’ needs, together with an overriding focus on sustainability. We have taken a truly holistic approach to the sustainable design of the lodges.